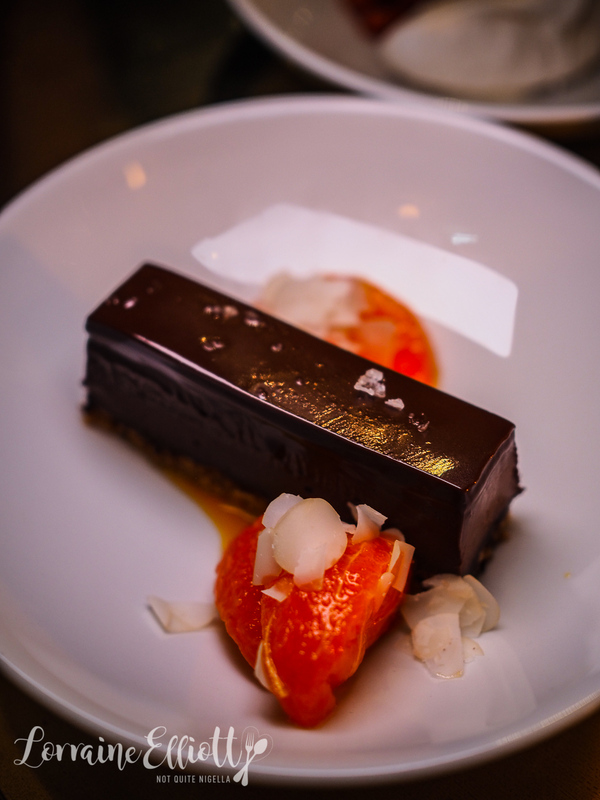 Surry Hills has a new venue, this time on Bourke Street. 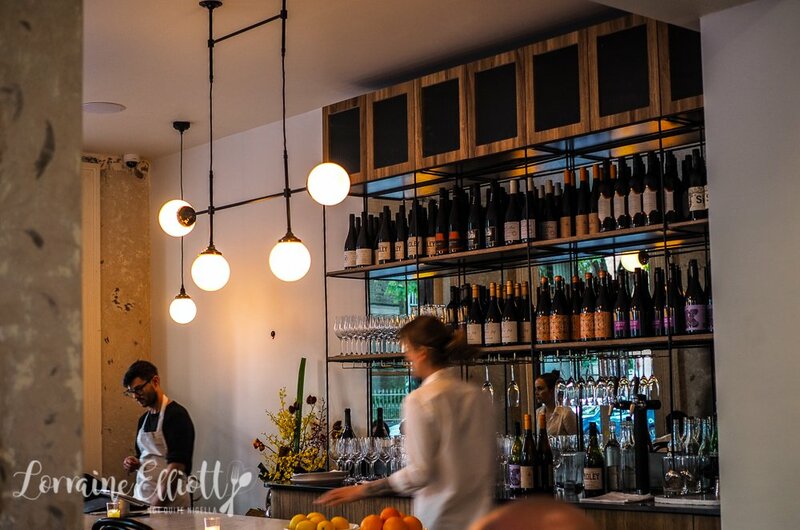 Arthur Restaurant takes up residence where Bar Baretto used to just opposite Bourke Street Bakery. It's a small, set menu only restaurant with share plates and eating that encourages conversation like a family dinner. All of this, in a heritage Victorian Art Deco setting with a modern interior. 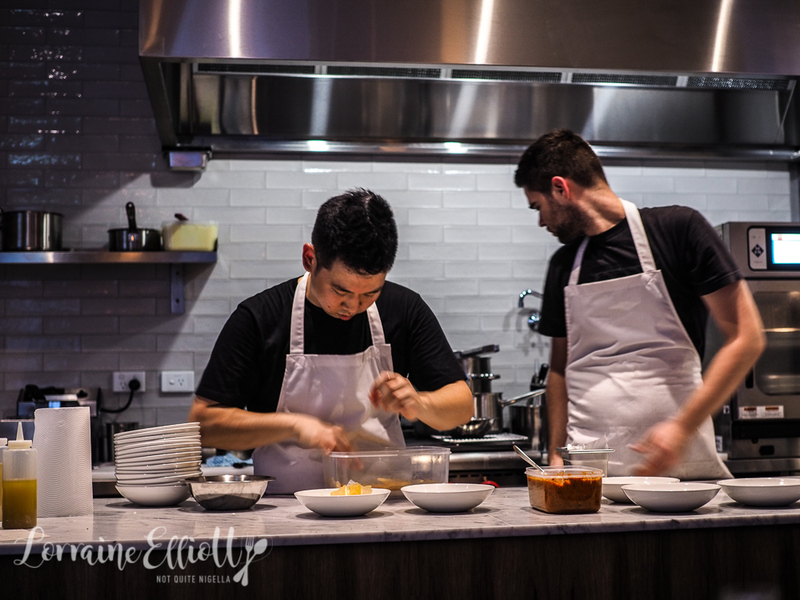 Arthur is named after chef Tristan Rosier's grandfather. The chef has opened the 35 seater restaurant with his partner Bec Fanning who works on the floor. 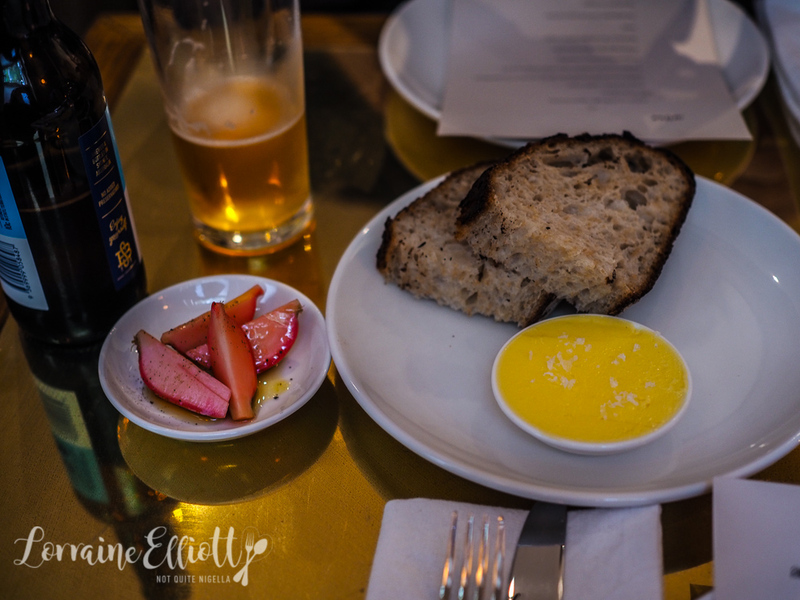 Tristan was formerly at Farmhouse and Dead Ringer and the food is served in a similar style to Farmhouse (set menu and share plates). 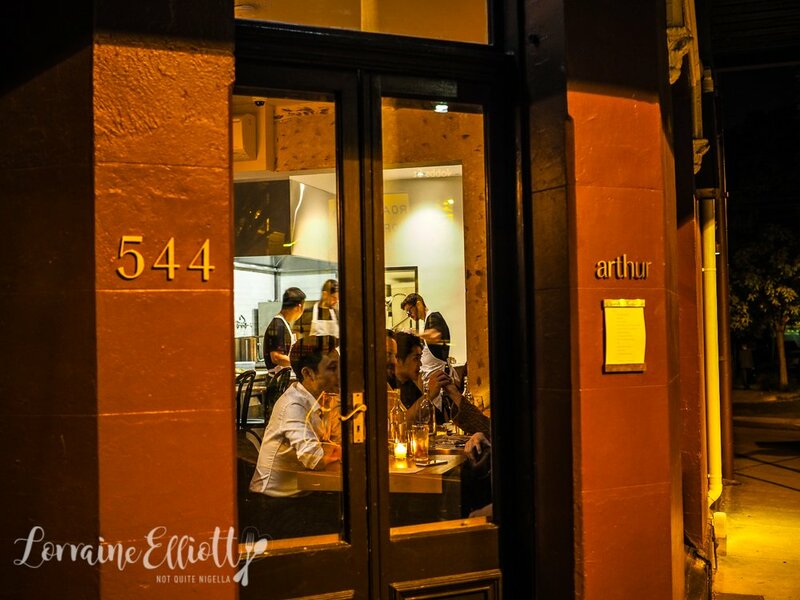 It was by pure accident that Mr X and I ended up at Arthur Restaurant on their very first day of service. I only knew about it because he had walked past it on his way to work the day before. We talked about going but Mr X was about to go away and the only night we could both make it was opening night. Arthur takes online bookings and they have set seating times (2 seatings most days and 3 on Saturdays) and a credit card is required to secure the booking. There is a small bar area that seats around 4 that you can also book but the majority of the room is made up of regular tables. If you have a dietary restriction, they ask that you notify them when you make the online booking. 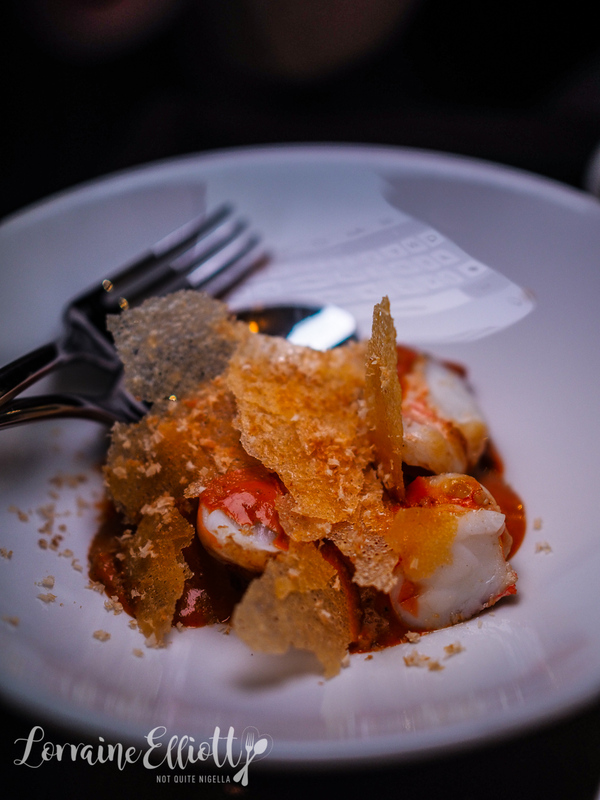 There is a single constantly evolving set menu with 12 dishes, served as 5 or so courses. At $70 it is amazing value although there is so much food that perhaps this may change (we both wonder how they can offer this much food at this price). The drinks list is brief, just two pages. Mr X has a beer while I start with a cocktail. 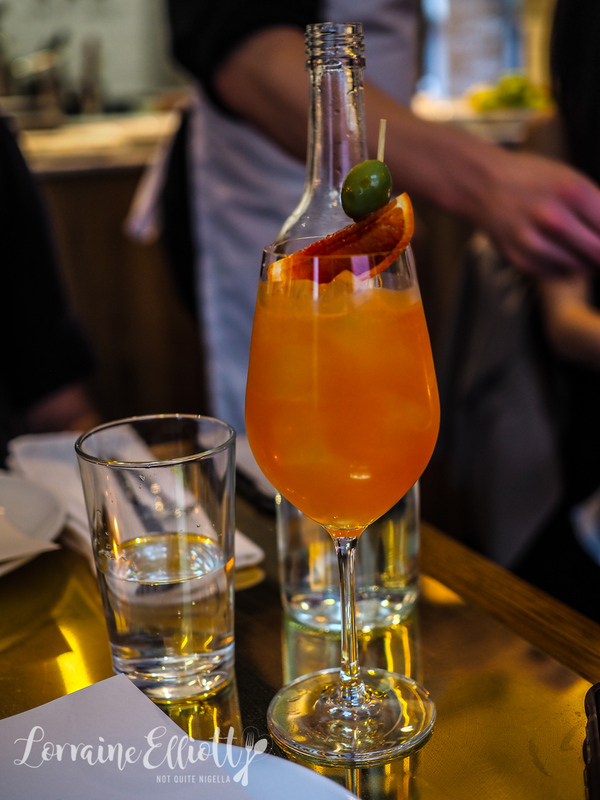 The blood orange spritz is sweet and not overly bitter or strong in alcohol. The first bites come out and we start with some fat, spongy sourdough with a thin, dark crust and plenty of soft surface area to spread the cultured butter. I pop a crunchy pickled radish quarter in my mouth. 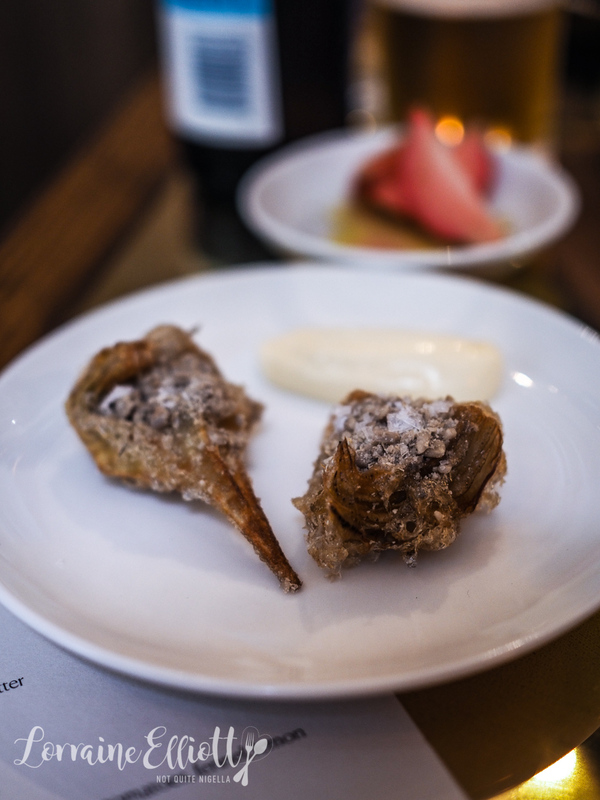 The next plate is a bite-sized globe artichoke, split in half and crumbed and deep fried in a thick, creamy garlic mayonnaise. It's hot, crunchy and well seasoned. The next two dishes come out together and I notice all of the other tables get dishes at their own pace when they've finished them rather than a simultaneous drop of food. 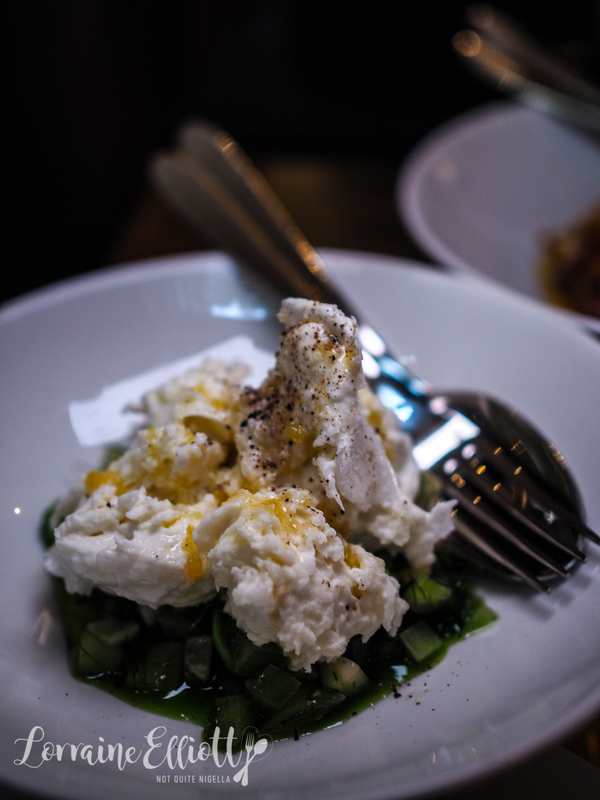 The salad has some freshness from the green tomatoes, fennel and lemon and creaminess from the torn mozzarella. 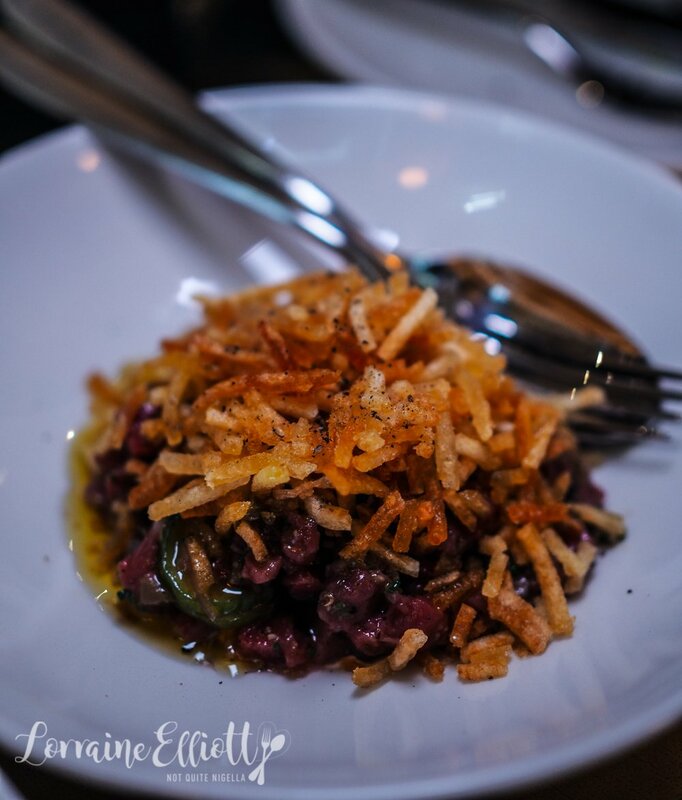 It comes with the kangaroo tartare, all gaminess of the kangaroo gone when the meat is served raw. It's seasoned with pickled cucumbers, bush tomato and potato crisps on top for crunch. The prawns are cooked well and served cut up so there is no wrestling with heads or shells. I love a bold romesco sauce-this one is milder than I've had. 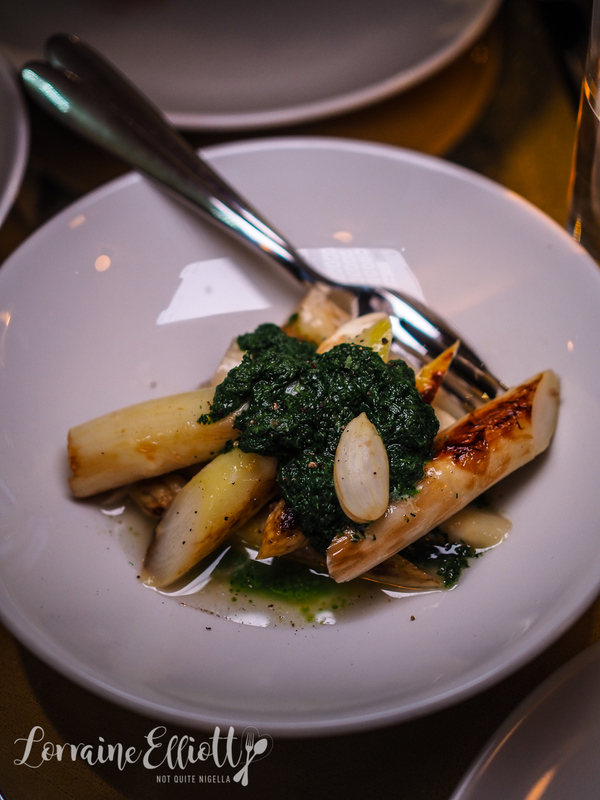 The white asparagus are fat spears of asparagus with almonds and a herby sauce. By now we're really full and we could have honestly stopped after the asparagus above. 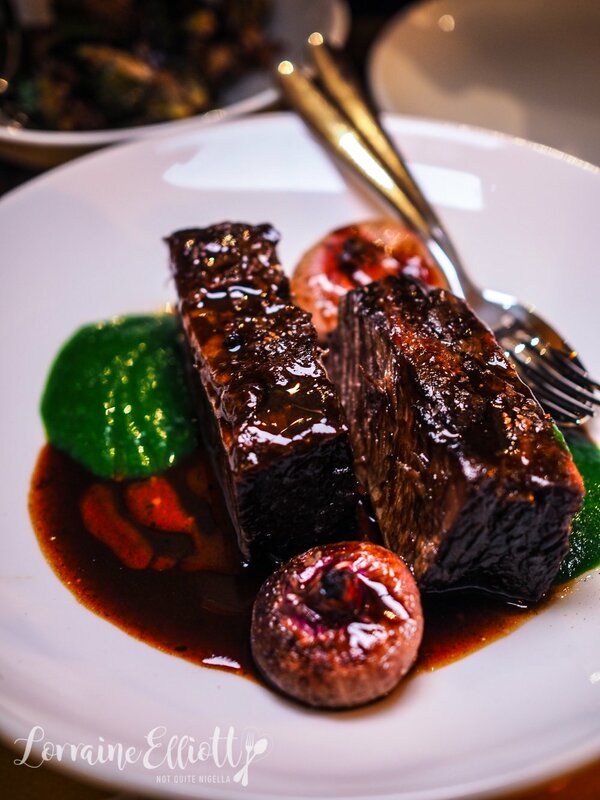 We end up sharing one portion of the beef short rib. It's soft but a touch undercooked. The small cipollini onions are sweet and there's a green radish top sauce and a richer beef stock sauce as well. 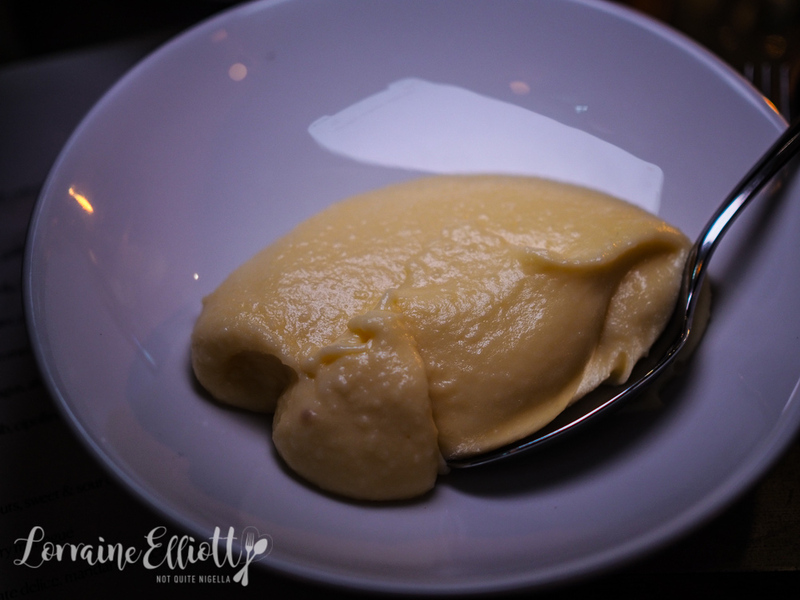 The beef comes with two sides including a thick and creamy mash. 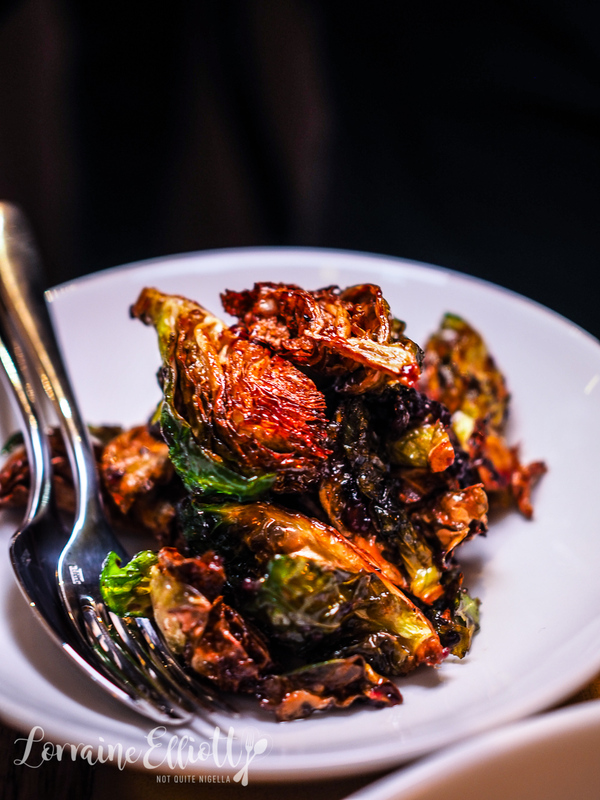 However I preferred the deep fried Brussels sprouts that are crunchy crisp with sweetness from sweet and sour currants. I have to admit that I peeked when they were making this as we were seated opposite the kitchen pass. They were poking holes in the bottom of the meringue to pipe kaffir lime cream inside. 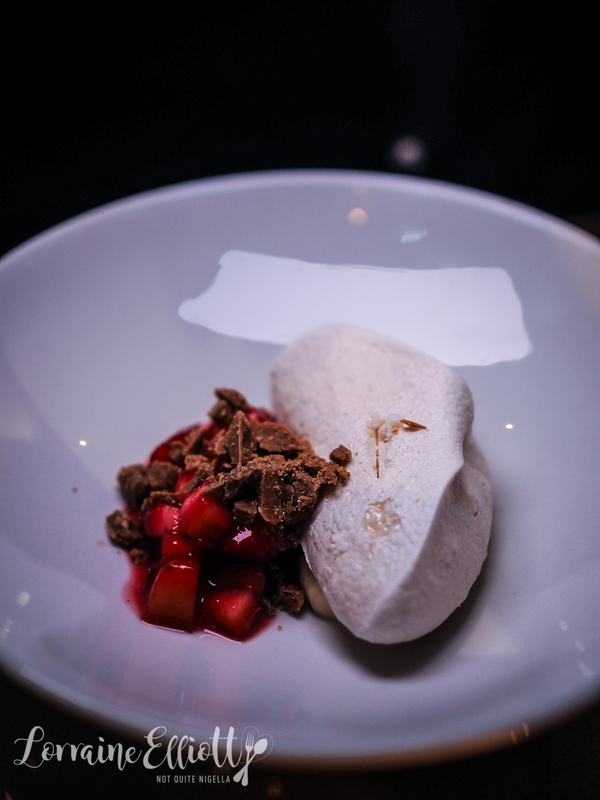 It is topped with fresh strawberries and caramelised white chocolate shaved for a sweet dessert. I did wonder if the kitchen would be able to keep up with the pace given its their first night and there is another seating at 8:30 but by just after 8pm Mr X and I have wrapped up our meal and the night is still young. 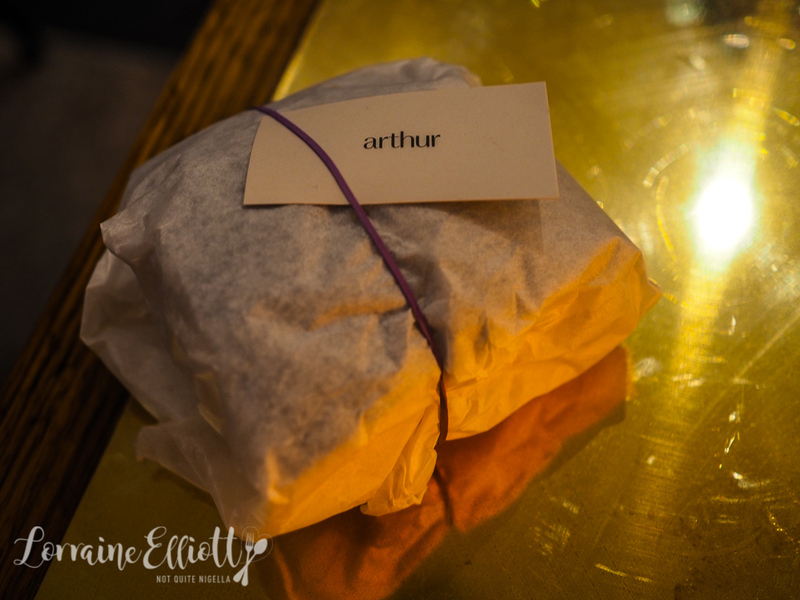 And at the end there is a thoughtful gift from the kitchen-a wrapped package of Arthur's sourdough to take home. So tell me Dear Reader, do you like the idea of having a set menu only? Do you find choosing food fun or a chore? And do you often dine out on a restaurant's first night?